RV Solar Kit keeps your batteries charged and healthy. 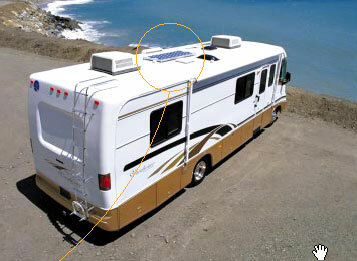 Avoid the hassle incurred by generators and having to find an outlet to plug into by running your RV with solar powe. Full batteries give you the freedom to run lights, furnaces, fans and more DC appliances without the worry of running out of power. Watch TV, DVD, video games - with healthy batteries you don’t have to give up the comforts you are used to wherever you choose to stay. ? ?The rugged durability of our solar panels guarantee you’ll generate solar power everywhere you go. All the components you need to setup your solar charging system are included in every OkSolar RV Solar Kit. Solar panels are mounted securely, and without worry of leaks, with the provided mounting hardware. OKSolar RV Kits are maintenance free and designed to give you decades of uninterrupted power.